10 Bridal Hair Accessories That Are Just The *Prettiest* EVER! A bride’s jewellery and accessories are the first thing that everyone notices at a wedding. And bridal hair accessories are getting more and more elaborate by the day. From maathapatis to maangtikas, hair chains and passas, there is so much to choose from. So dear brides-to-be, as you struggle to find the *perfect* piece for your big day, here’s all the inspiration that you need. These 10 brides wore the prettiest hair accessories and you’ve got to see the pictures! 1. A maathapati THIS pretty! Go big and elaborate with your maathapati and it’ll be the only accessory you need to complete your look. 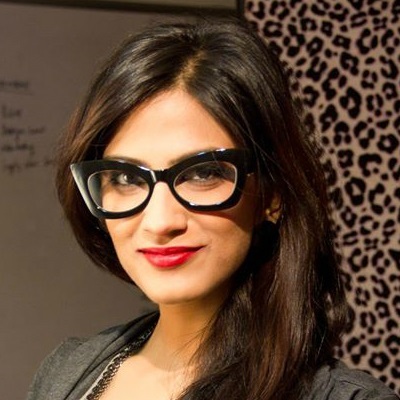 Anika Dhawan, Founder, Rani Pink, looks like a million bucks thanks to her royal hair accessory. An oversized maangtika with green beads is the perfect way to jazz up your look. We’re loving the bride’s statement hair accessory that makes her stand out and how! Passas instantly add that touch of royalty to your bridal look. And this bride is proof! We are loving the strings of white pearls and green dangling beads. Also, she’s matched it so well with her lehenga! Maathapatis come in various styles and we’re totally crushing on this one with gorgeous danglers. So pretty and so very bridal! 5. Add a hint of colour! Aren’t you loving this chaandbali passa with the most gorgeous maroon and green beads? A statement accessory like this is just what you need to complete your bridal look. Diamonds always look spectacular. And we’re all for this bride who wore a dazzling maathapati and a passa to match. The pearl beads look stunning and we can’t help but love this look. 7. For the summer bride! Such a fun and fabulous picture! The white beads, the hint of pink and the gold base - everything looks so perfect. The maangtika and the matching passa are a great look for a day wedding. 8. Go big, go elaborate! Did you just say you want something exactly similar for your wedding?! Yeah, we get it! Absolutely crushing on the bride’s elaborate maathapati. The mint green beads and the dangling jhoomers are picture perfect. Can’t take our eyes off this beautiful image. 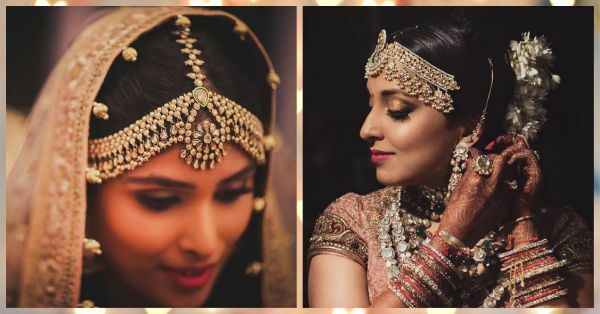 The bride is a vision in a statement jadau maathapati and we have to admit, it’s one of our favorite jewellery pieces. Stunning, right?! 10. A pretty oversized maangtika! Rounding off this list is a pretty picture of a Sabyasachi bride wearing an oversized maangtika. The red beads look beautiful against her all-gold lehenga and we love how she’s kept the rest of her jewellery minimal.